Just over 1 in 4 of today's 20 year-olds will become disabled before they retire. One in eight workers will be disabled for five years or more during their working careers. Outdoor careers are not risk-free. People should consider how adaptable their career of choice might be if they became disabled at some future date. Cross-training when you are healthy may save your career if you became disabled later in life. Disability can happen to you. The federal laws that prohibit employment discrimination based on disability all share the same fundamental goal: to remove the barriers to employment faced by individuals with disabilities. However, not all of these laws apply to all employers. Whether or not a law applies depends on several factors, such as whether employers are in the public or private sector, how many employees they have and whether they hold federal contracts or subcontracts. Disabled persons entering the work force have a good chance at a federal job.Full-time permanent employees with disabilities represented roughly 15% of the overall federal workforce in fiscal 2015. You must be qualified to do the job you are seeking. The ADA defines qualified to mean a person who meets legitimate skill, experience, education, or other requirements of an employment position that s/he holds or seeks, and who can perform the essential functions of the position with or without 'reasonable accommodation'. Requiring the ability to perform 'essential' functions assures that an individual with a disability will not be considered unqualified simply because of inability to perform marginal or incidental job functions. If a person is qualified to perform the core or essential job functions except for limitations caused by a disability, the employer must consider whether the individual could perform these functions with a reasonable accommodation. If a written job description has been prepared in advance of advertising or interviewing applicants for a job, this will be considered as evidence, of the essential functions of the job. All state and federal careers should have published job descriptions. If you want a career with a natural resources agency, most federal agencies have goals set for hiring persons with disabilities. See if you can connect with that agency's disability specialist who may be able to advise you on their job hiring practices and willingness to accomodate you. Not all offices will be suitable. It is extremely important that people with disabilities connect with organizations that can assist them in their job search and provide services that support them once they are employed. Job seekers should connect with professional organizations, attend job fairs, and network. Obtaining a job in career position that is essentially an 'outdoor' job may be very difficult for certain types disabilities. For example, if you use a wheelchair it would be more difficult to be a 'field forester' where hiking up rugged mountains or crawling through thick brush, or fighting fire was a required part of the job. However, a forestry data analyst position should be entirely possible. There are a lot of jobs within every state and federal natural resource agency that should be ADA friendly. Government jobs often provide good opportunities for persons with disabilities and such agencies are also required by law or executive order to increase their number of employees who have disabilities. If you want to understand how aquiring a disability after being hired could make a reasonable accomodation necessary, get informed. If you have a permanent disability (or develop a functional disability through accident or illness), then take a hard look at adaptive equipment that may enable you to continue in your profession. You may have to get creative in terms of gear. You need to know how using a device or tool enables you to do the essential functions of your job. If you can provide examples illustrating how an employer can accompdate you, it can increase your chances of getting that job. Age discrimination does exist and can be a serious employment barrier for older adults. In some circumstances, though, age (and experience) can be a real plus. Some federal agencies are more age-friendly due to the population they serve. Many employers need experienced older adults who don't need to be trained every step of the way and who can hit the ground running. Age can be a positive as well as a negative so pick your job targets accordingly. Not too surprisingly, certain types of jobs at National Parks, outdoor resorts, camps and recreational sites may have some good opportunities for people with disabilities or the older job seeker. Summer and seasonal jobs are good places to start looking. Don't overlook volunteer opportunities, too. Employers often hire people they know. Keep in mind that job hunting is difficult for everybody. No excuses! Perseverance pays off! 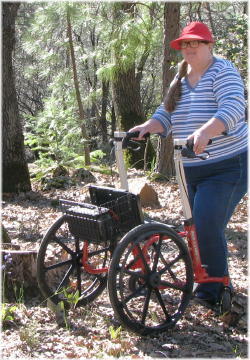 Need an all-terrain mobility walker? Please read my review of the Walk'N'Chair! You may be able to find a college or university that is more user-friendly than average. Get the education you deserve and need to pursue your goals. U.S. federal government website for information on disability programs, employment and services nationwide. Be sure to read the January 2015 newsletter for important job tips. ODEP is committed to increasing the participation of people with disabilities in green jobs nationwide. Be sure to download the Green Resource Guide. If you have a spirit of adventure, and a passion for the outdoors, then take a look at the wide variety of jobs available. Let them connect you with a volunteer opportunity through a local adaptive sports group. This program is designed to ensure individuals with disabilities enjoy equal opportunity in all aspects of employment within the US Forest Service, including hiring, promotions and reasonable accommodation. There is just contact information. Contact these people and get more information. There is a more extensive list in PDF here. Encouraging diversity and inclusion and equality in the federal workplace. first and largest employment website for job seekers with disabilities. Enable America's objective is to increase employment among people with disabilities in the United States. Links to job search resources. Xanterra Parks and Resorts provides career opportunities in all sorts of exotic locations. Make a difference in the lives of people with disabilities through a life-changing career in adaptive sports. Discover how COSD can help you find a meaningful career as you navigate through school. The National Recreation and Park Association's Career Center is a good resource for park and recreation professionals. Empowering individuals and Veteran's with disabilities. Finding the correct keyword might be a little tricky, but there are lots of jobs listed for most states, just not a lot of natural resources jobs. USAJOBS is the Federal Government's official one-stop source for federal jobs and employment information. Be sure to read the information in the 'Resource Center' for individuals with disabilities. Entry Point is the signature program of the AAAS Project on Science, Technology, and Disability. Entry Point identifies and recruits students with apparent and non-apparent disabilities studying in science, engineering, mathematics, computer science, and some fields of business for outstanding internship and co-op opportunities. Candidates with diverse backgrounds encouraged to apply to this organization dedicated to the protection of endangered species and wild places. The USFWS is committed to fulfilling the Executive Order on Employment of Individuals with Disabilities in the Federal Government. It is CDFW's policy to provide employees and job applicants equal opportunity regardless of any known or perceived disability. CDFW makes Reasonable Accommodation (RA) available when an otherwise qualified disabled employee or job applicant requires assistance in order to participate in any and all aspects of the employment process. Youth Conservation Corps (YCC) is a summer employment program for diverse young men and women ages 15 through 18 from different backgrounds to work, learn, and earn together by doing projects to protect public lands.Youth from all social, economic, ethnic, racial, and disabled populations are encouraged to apply. Careers and the DisABLED magazine may be a useful career search tool. Included are companies that are actively recruiting. While the magazine doesn't have a real focus on natural resource occupations, the articles may help you hone your job hunting skills. Search through the EOP'S Diversity and Inclusion Career Center's online jobs to find your new professional career path. Use keywords like Wildife, Forestry or a similar term to narrow down the jobs. WWP has a variety of programs, including economic empowerment for wounded Veterans. Also, check out the hiring information at Feds Hire Vets. While these are not specific to conservation occupations, they could be very useful resources. Sometimes finding a job or the career you want is so difficult that you need to find another path to your goal. I've done that when unemployment numbers were really high. Sometimes it's actually easier to start a business than it is to get a job. Sometimes the only person that will hire you, is YOU. So, give it some thought. Empower your own dream. If you can't find a job you want, start your own business with an employee of one - you. Starting a business can be a great opportunity for many people with disabilities. In addition to meeting career aspirations and goals, owning your own business can provide benefits such as work flexibility and financial stability. Find out if self-employment may be a good option for you. Owning a small business provides flexibility that is often missing in agencies and corporations. Owning a business with assets, property, equipment and/or cash in business accounts does not cause loss of SSA disability benefits in most cases. It does require some careful planning, just like any business venture.